Up and about early yesterday morning and keen to make amends for a less than satisfactory hit out in my previous training session. Not sure if it’s the increased road running, old age of just lack of conditioning but still experiencing some calf soreness. Running on grass and on a nice flat track was something I haven’t done in a long time and my legs enjoyed the break and I managed to produce a reasonably good time. Although – how freaking boring is it running in circles? But, as I said, my legs were certainly less sore – so I’m planning some shorter runs during the weeks ahead which will include running on the oval. The tedium of not much to look at is more than offset by the respite for my ageing legs. When I start getting sore, I do get a little paranoid – but not without reason. I have been plagued with ITB syndrome which is and abbreviation for Iliotibial Band syndrome. If you’ve had it – you know how frustrating it can be. It is painful but not excruciating – but it is debilitating. You just can’t run when you have the issue and the physiotherapist’s advice is – ice then rest! So the only way to get over ITB soreness is rest – which is not very helpful in the middle of a training program with a race at the end of it! For those of you who have been affected (and for those who haven’t and don’t want any ITB issues) I offer the following background, advice and tips to manage a dodgy ITB or ensure you don’t get one. Firstly, what is the ITB syndrome? ITB syndrome is essentially an overuse injury very common with runners. Anyone afflicted by ITB syndrome will experience pain and tenderness of the outer thigh and knee just above the joint. That is why many runners mistakenly think they have a knee injury. 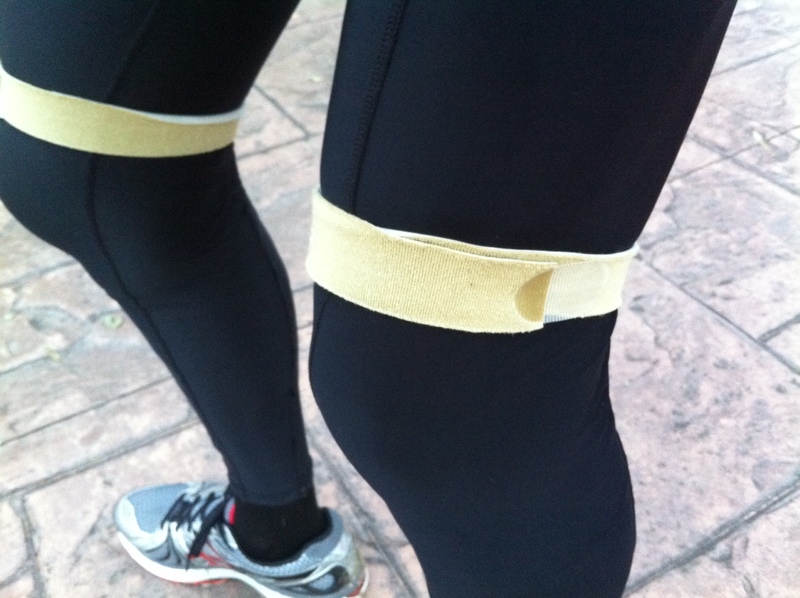 When the ITB comes near the knee, it becomes narrow, and rubbing can occur between the band and the bone. This causes inflammation. The iliotibial band runs along the lateral aspect of the thigh and is an important structure that stabilises the knee as it flexes and extends (See the picture below). What causes the ITB syndrome? ITB syndrome usually happens from any activity that causes the leg to turn inward repeatedly. This could be caused by wearing worn-out shoes, running downhill or uphill, or on banked surfaces, running too many track workouts in the same direction, or simply running too many kms. For me I noticed for the first time after extended hill running, but it soon became every time I ran. I could feel the ITB rubbing, creating almost a slapping or tapping sensation on the side of my thigh right down to my knee. The pain was intense and it was all but impossible to run any reasonable distance. For a while I there I didn’t think I would ever be able to do any more distance running. However, there are ways to manage your ITB to prevent issues and ensure if you’ve had them they don’t slow you down for too long. Once you notice ITB pain, the best way to get rid of it for good is to rest immediately. That means fewer miles, or no running at all. RICE and anti-inflammatory medications are first-line treatments. You can get some physical treatment such as ultrasound, massage and general physio – but surgery is apparently not an option. Important to note that you must be patient and you have to let your ITB recover. If you don’t the ITB syndrome can become chronic which could significantly hamper your distance running for much longer than the recovery period. Prevention is a key component and includes keeping muscles well stretched. 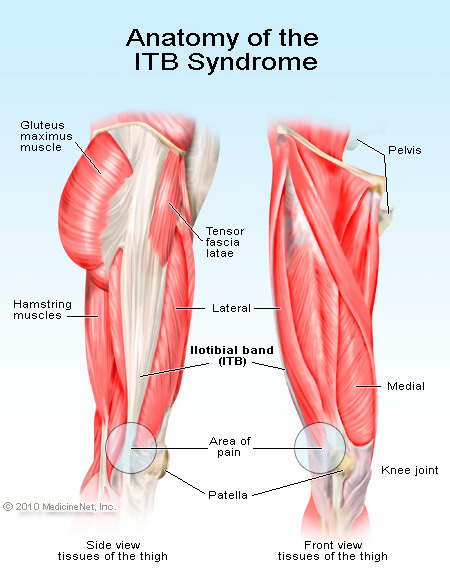 I have had the ITB syndrome re-occur a few times and in both legs. I have found that the following can assist in prevention. Decrease your kms or take a few days off from training if you feel pain on the outside of your knee. Avoid exercises such as squats and step ups. Warm up properly before a run by either riding or walking. Cool down properly with stretching and ice strapped to the ITB area. If you can go for a swim or wade in cold salt water – big help also I find. Very importantly, make sure your shoes aren’t worn along the outside of the sole and monitor your kms – if you are over 650km you’re overdue for new shoes – replace them. Run in the middle of the road where it’s flat or on tracks where there is no camber. If you are going to run down the middle of the road you better be good at dodging cars or find roads with little or no traffic and good visibility. Avoid very hard surfaces such as concrete. Mix up your running tracks and the direction you run to avoid repetition. See a podiatrist if you can’t shake it, as you made need orthotics. The most important one of all and why I have left it until last, is stretching (only when you are warm) your ITB. Be focused on it and don’t short change exercising and stretching it. This will pay huge dividends. Rather than provide you with a list of all the exercises to help you stretch your ITB check with your physio, gym instructor or simply Google ITB stretches. There are many to choose from and look for what suits you best. Now, aside from this there is a solution which has worked for me to aid in my recovery and enable me to run even with some ITB soreness. It’s called a PattStrap. I still wear a PattStrap every time I run (see below – as you can see I have ITB issues on both legs) and I have found it very helpful. The PattStrap is a product made by Fabrifoam® Products, and is simply a small strap that goes around the leg, just above the knee. The strap uses compression therapy on joint swelling related to ITB syndrome and can be worn while active as well as while you’re stretching or resting. It might look weird – but it works. There are other styles on the market so best to look for what works for you. So I hope that helps. If you have had ITB issues and have some advice please feel free to share and if you have any questions let me know. Anyway, thanks for dropping by – a bit of a longer post to cover information about the ITB syndrome. This entry was posted in Marathon Training and tagged endomondo, iliotibial band syndrome, illiotibial band syndrome, injury prevention, itb, music, pattstrap, playlist, preparation, runners, running, running music, shoes, training. Bookmark the permalink.